1. 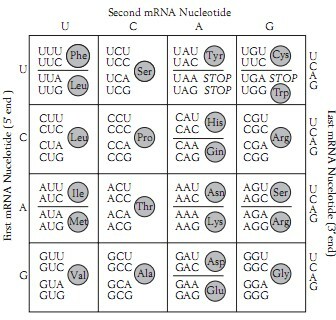 The genetic code table shows the amino acids that correspond to mRNA codons. Each codon is read from 3' (first nucleotide) to 5' (third nucleotide). A DNA template strand is shown. Which amino acid sequence will be assembled from the mRNA associated with this strand? 2. Which answer choice matches the functions listed below to the correct RNA types? 3. An original cell replicates its DNA. The cell undergoes mitosis and cell division, and one of the daughter cells replicates its DNA. Which of these BEST describes the DNA of the second-generation daughter cells? A. One of the cells will contain DNA consisting of one strand from the original cell. B. One of the cells will contain DNA consisting of two strands from the original cell. C. Both of the cells will contain DNA consisting of one strand from the original cell. D. Both of the cells will contain DNA consisting of two strands from the original cell. E. Neither of the cells will contain DNA consisting of strands from the original cell. 4. The partial sequence of a single DNA strand is shown. What will be the sequence of the complementary strand produced during DNA replication? 5. 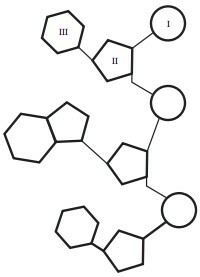 Which of these labels matches the structure of the partial RNA strand shown?